The corruption scandal in Spain and resurgence of anti-market PM candidate Berlusconi should continue to create uncertainty with a distinctly bearish effect, for reasons we discussed in earlier posts here, here, and here. Until these are settled the uncertainty will pressure the pair. Keep an eye on related headlines, but especially on the bond yields of both nations. Steady of falling yields suggest steady or rising confidence in their creditworthiness, while rising yields suggest the opposite. Last week yields rose for both nations and are likely to continue to do so as long as political evens suggest these nations’ economic troubles will continue or worsen. The coming sequestration battle is where many expect the Republicans to push for spending cuts, at least for a while. That could result in layoffs for tens of thousands of government employees, and limit their spending, as well as the spending of those who sell to them. That uncertainty, combined with the recent payroll tax cut expiration means wage earners are now taking home less money than they were a few months ago. While that likely drop in consumer spending more directly effects the US than Europe, it is clearly a risk-off, bearish phenomenon, and so is likely to hurt this pair, which is a risk asset. 3. Economic Calendar And Data: Probably Bearish – But Will That Matter? While historical patterns aren’t guaranteed to repeat, it’s hard to bet against that kind of track record. Is there any compelling reason to say things could be different this time? As asked said in our summary of all 2013 forecasts here and here, how much do you believe the historically unprecedented global stimulus will make a difference, at least for asset prices? Of course, you can argue that 2012’s limp GDP came after over 2 years of steady stimulus, so while that may help asset prices, it’s clearly not turning things around. On the one hand, risk assets in general, and the EURUSD in specific, have strong, entrenched upward momentum. Even last week’s pullback did not change that yet. However, after having decisively breached strong resistance at the 200 week EMA the pair has now returned to that level, which now serves as support. If the pair closes the coming weeks below that level, the rally would indeed be in doubt because the 200 week EMA would again be viewed as a strong resistance level that bent but did not break. Hint: Would you bet that risk assets have much more room to move higher? 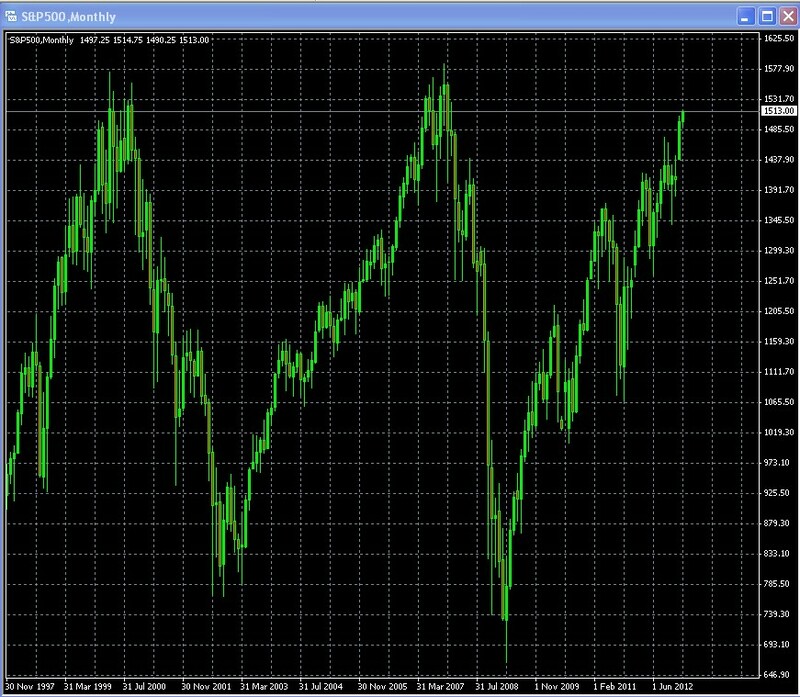 Look what happened the last two times the S&P 500 (as good a single picture of support and resistance for risk assets as any) reached these lofty levels? Who will take it from you? An awesome rock & roll classic, listen here. I don’t know if my generation still has soul, be we are definitely getting sold (out). The Fed, ECB, BoJ, BoE and others are either actively debasing their currencies, and along with them our savings and anything denominated in it. You can’t fight the Fed? Well here’s a chance to strike some “blows against the empire” of these central banks and their very real financial repression. Who will take it from you?-These same central banks (in the name of fairness, of course). We have one week, until this Friday, to strike a small blow. How? Help show the investing community a range of safer, simpler ways to diversify into healthier currencies, (or assets linked to them) that are run by honest central bankers who aren’t out to rob us in order to fund their debt payments with inflated currency. First, if you haven’t done so already, see here (North America) or here (outside of North America) for information about the most up to date guide on a wide range of conservative strategies to diversify into the currencies most likely to hold their value, and the assets linked to them. You can find a topic summary, reviews, and even read huge chunks of the book. 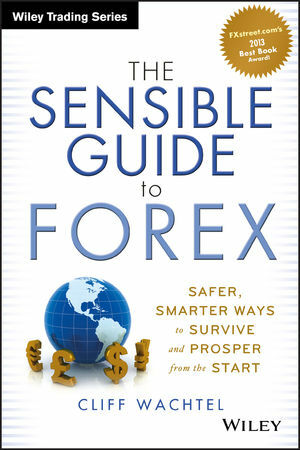 Second, please take a moment (about 120 seconds, actually) and cast your vote for “The Sensible Guide to Forex” in FXstreet.com’s Awards 2013 in BEST NEW BOOK category. The link to the survey is here. A win might help draw some additional attention, and help others hear about how they can be liberated from the ongoing financial repression. I know something about markets, but not so much about book marketing. So your vote would be greatly appreciated.